The National Alliance for Youth Sports posted an article citing football as the deadliest sport for youth athletes. The information was gleaned from a study conducted by Barry Maron of the Minneapolis Heart Institute Foundation using information from the National Registry of Sudden Death in Young Athletes. 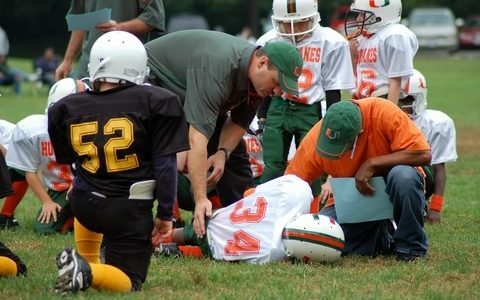 The study revealed that football accounted for 57 percent of sports deaths among young athletes. Many of those deaths could have been prevented if the athletes with head injuries had been kept off the playing field, according to the research team that scrutinized 30 years of data. Of the 138 football deaths caused by head or neck injuries, 12 percent were players who returned to the playing field following a concussion. Their deaths were caused by what is called ‘second-impact syndrome.’ Some of these athletes were cleared for play despite displaying symptoms from a previous head injury. The position of running back was the single most deadly position in football, according to the research, with 33 deaths in 30 years. There were 69 deaths that occurred among various defensive player positions.